I’ve made thousands of smoothies in my life but this one is special. Because I’ve never made a lava flow smoothie but I’m hooked now. 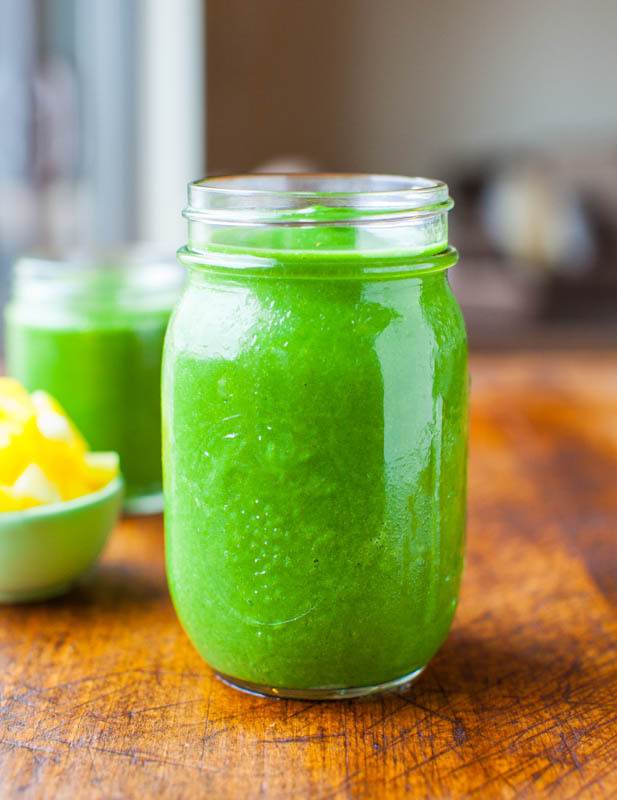 Fast, easy, healthy, refreshing, and tastes wonderful. It’s so creamy and tropical-tasting and perfect for this weather. Oh and it looks cool which counts for something, right. 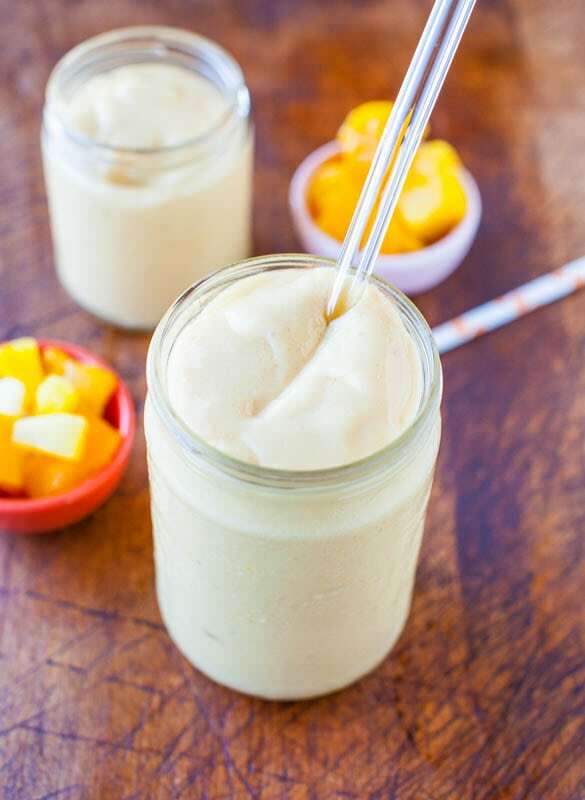 The light portion is pineapple and banana blended with Silk Unsweetened Cashewmilk. 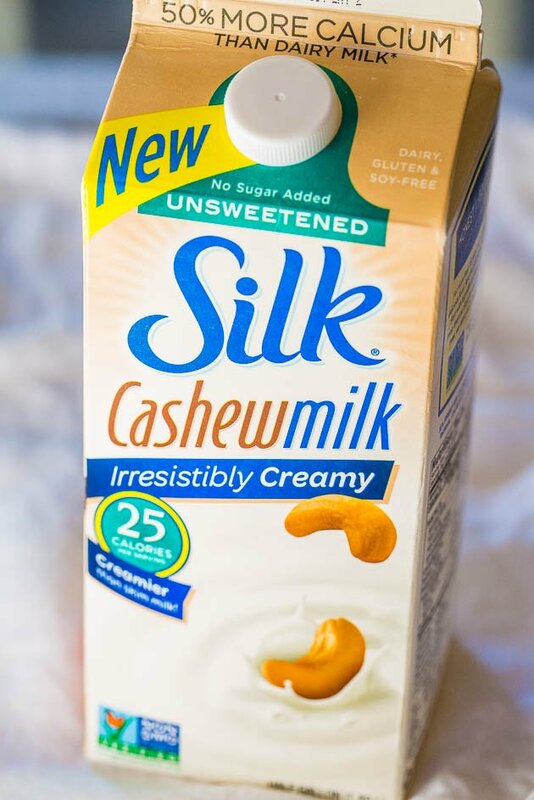 It’s so irresistibly creamy and thick but with fewer calories than skim milk. Eating more plant-based protein is a great goal and Silk Cashewmilk or Silk Almond Milk are my milks of choice for baking and smoothies. They’re so low in calories and fat, they’re vegan and dairy-free, and I always get impressive-tasting results. It’s the perfect match between tasty and guilt-free. The red portion is simply blended frozen strawberries. 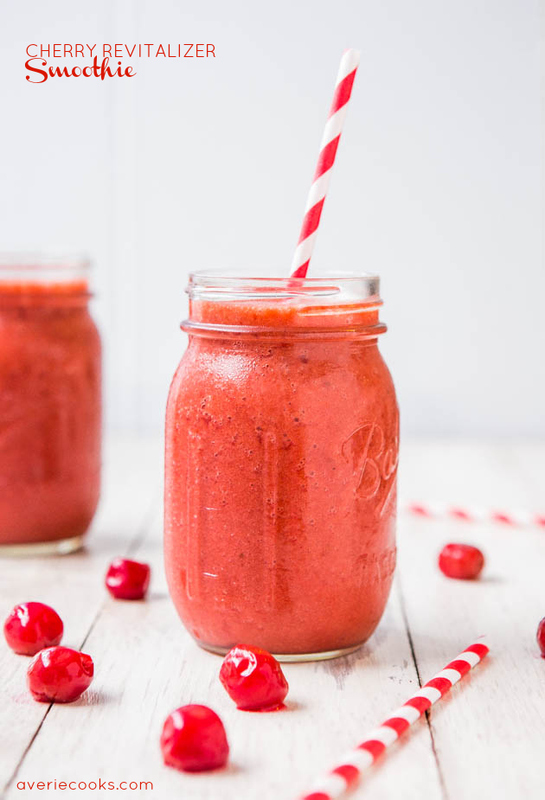 By using frozen fruit, I didn’t need to add ice which can water down smoothies. Plus frozen is cheaper and readily available even when it’s not berry season. The fruit is naturally sweet so I didn’t need to add sugar which is always a win. I’ve never made a lava flow smoothie but I’m hooked now. 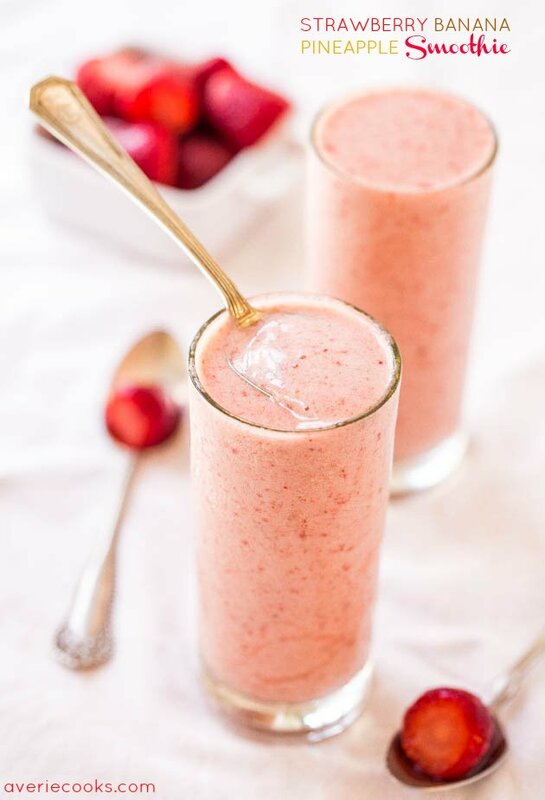 Fast, easy, healthy, refreshing, and tastes wonderful. It’s so creamy and tropical-tasting and it looks cool. 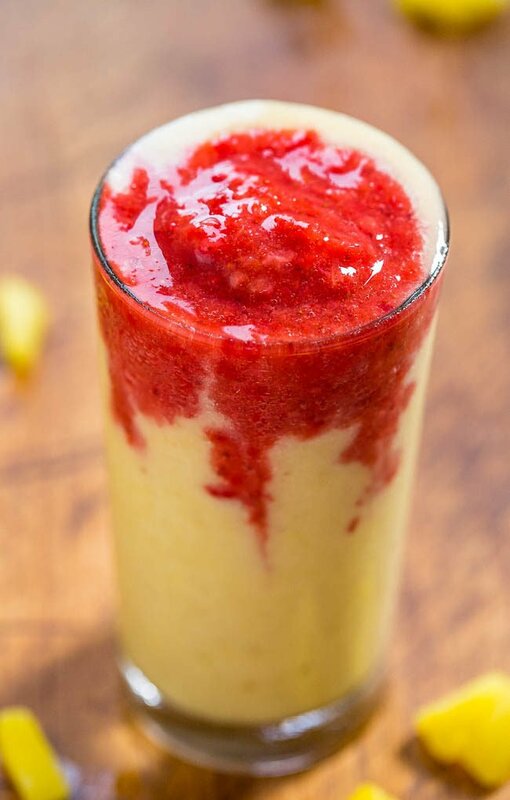 By using frozen fruit, I didn’t need to add ice which can water down smoothies. Plus frozen is cheaper and readily available even when it’s not berry season. The fruit is naturally sweet so I didn’t need to add sugar which is always a win. 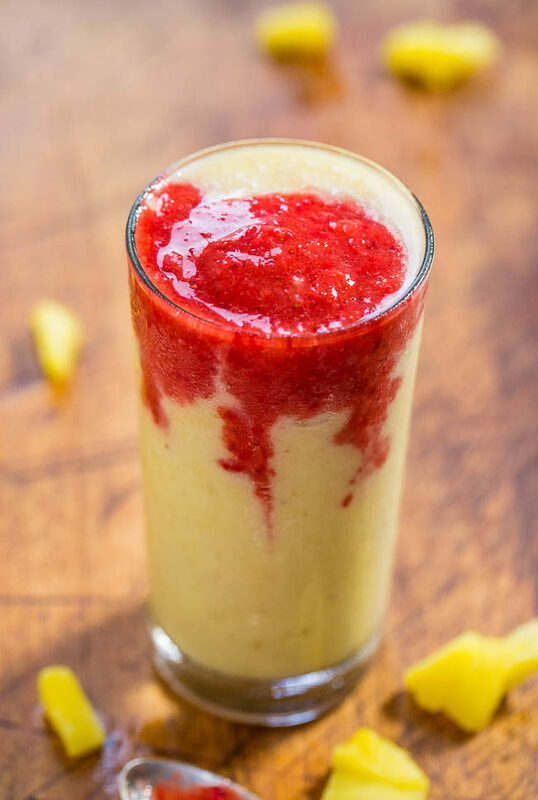 To the canister of a blender, add the banana, pineapple, 3/4 cup milk and blend on high power until smooth. 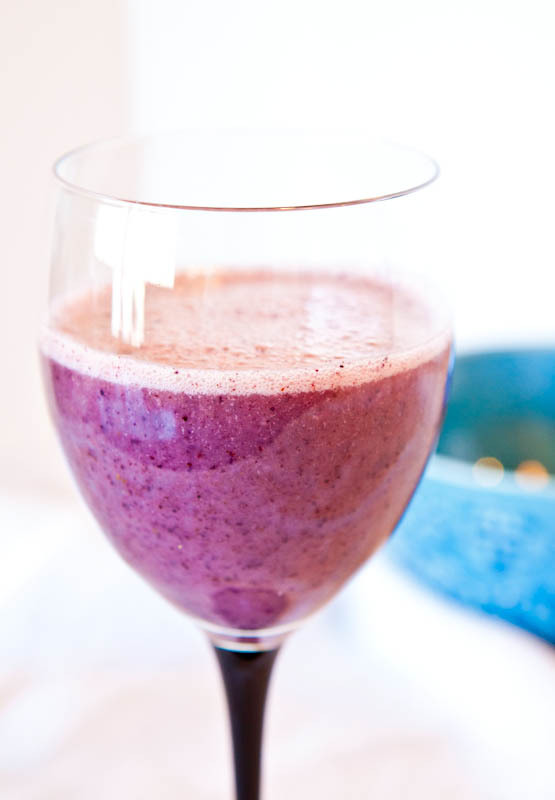 Slowly add more milk if necessary to get blender moving or until desired smoothie consistency is reached. Pour into one large glass or divide between two glasses; set aside. Rinse blender canister and add the strawberries. 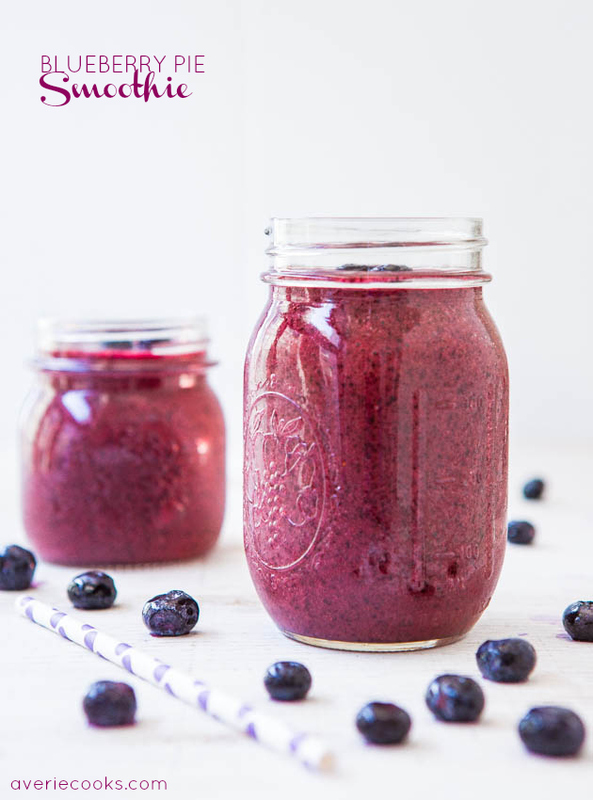 I use frozen berries that I allow to thaw at room temp for about 30 minutes; alternatively use fresh berries that you freeze for about 30 minutes. Optionally add sweetener to taste, and blend on high power until smooth. Top the banana-pineapple portion with the strawberries and serve immediately. 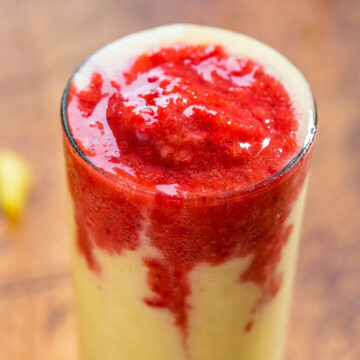 The strawberries will seep down over time into the banana portion to create the visual lava effect, but use a straw to encourage it if desired. 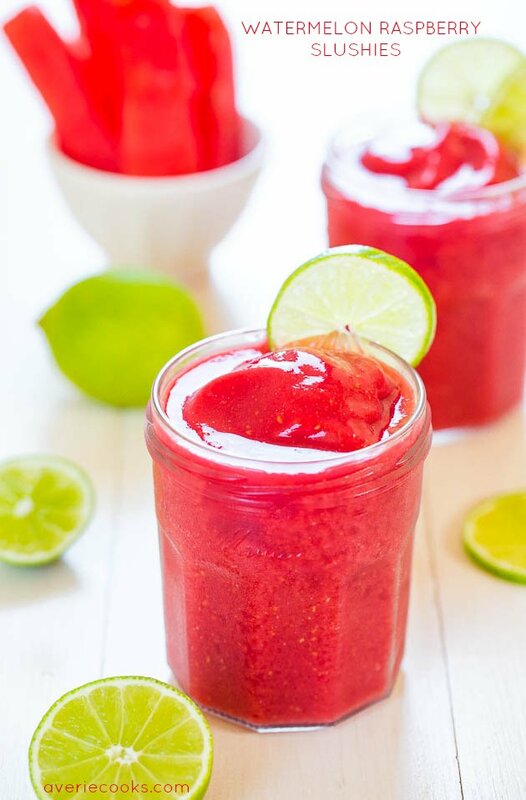 Watermelon Raspberry Slushies – Cool, refreshing, and you’ll want a refill before you know it! Optionally add alcohol and get the party started! 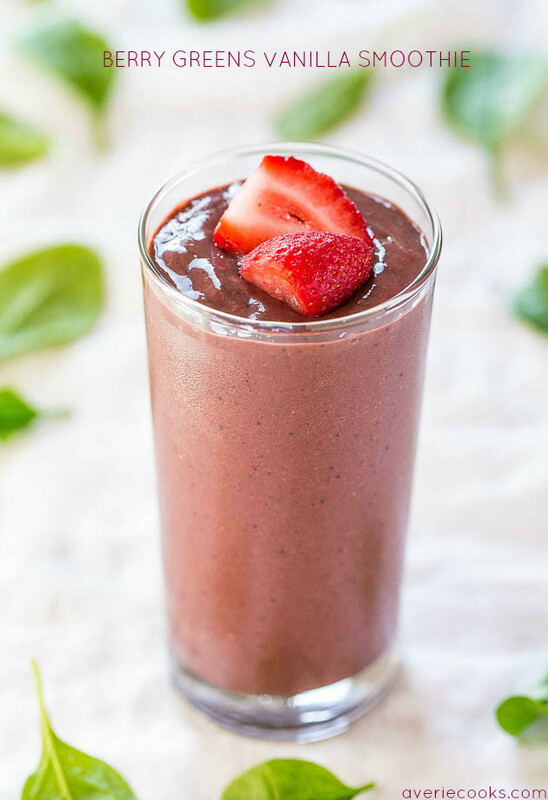 Berry Greens Vanilla Smoothie – Healthy, easy, and tastes amazing! You’d never guess it’s packed with greens and so good for you! Hope you and your kids enjoy it! Hope the rain stops for you! 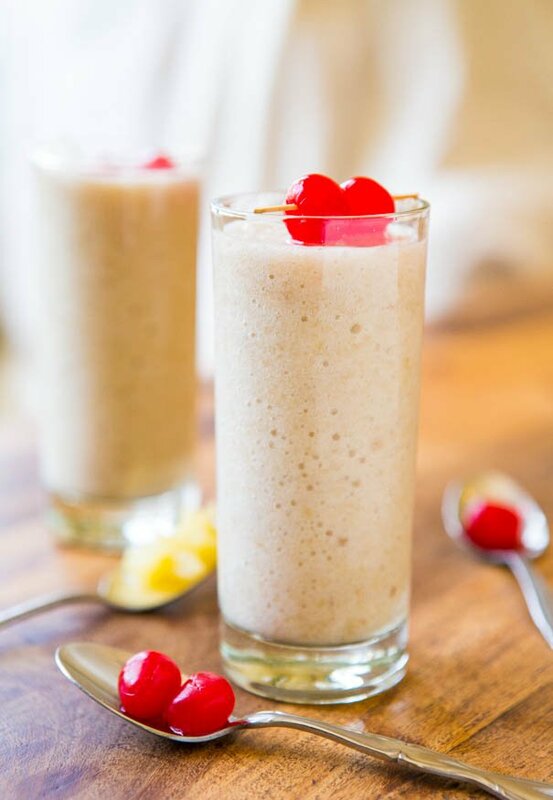 I’ve never heard of a lava flow smoothie but I can see why you’re hooked–I love the two toned color effect! If I had bought pineapple yesterday instead of mangoes I could make this today. I’d love to try this! It was serendipity that you bought pineapple instead of mangoes yesterday! LMK if you try it! Looks beautiful, Averie! And another great case for using the cashew milk. You’re very devoted to it! 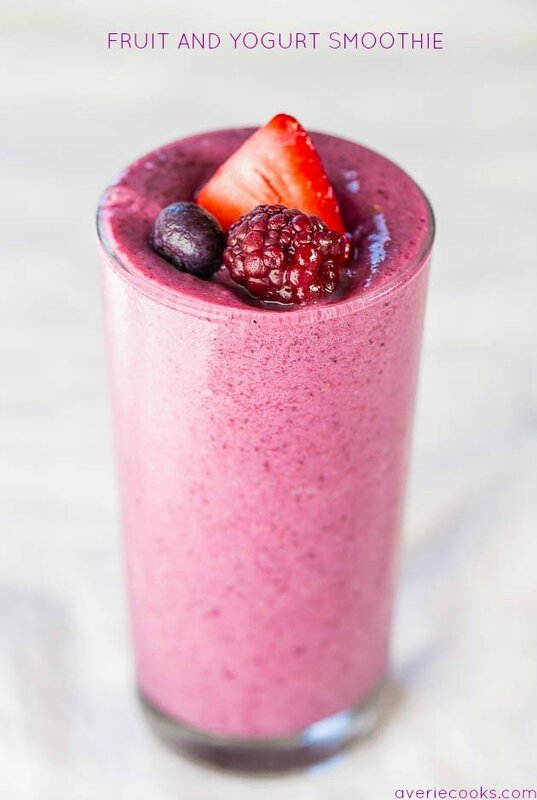 “looking cool” always counts in my book lol and this smoothie looks smoking HOT, just like the name, love how simple it is, but looks like a million dollars drink, making it asap! Glad you like the looks of it too and if you made it, hope you enjoyed it! This looks fantastic!! I love the lava flow, it reminds me of Hawaii. And I’d totally add rum to it, ha! 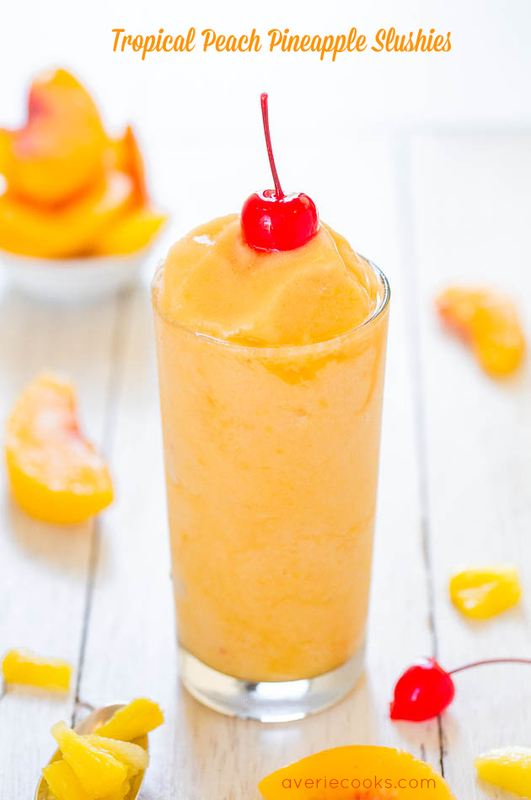 This looks great–we are having smoothie weather here today–yum! 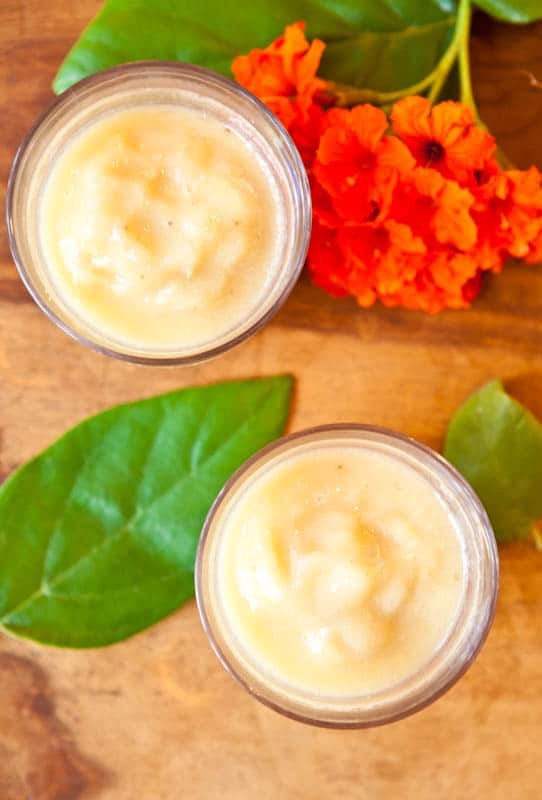 A fun look is half the success when it comes to smoothies and my kids! This one is a winner all the way! Pinned! I bet this tastes and smells like Hawaii!! You have my attention! I can’t wait to try this. This would e perfect this afternoon as the sun is sweltering and the kids are playing in the back yard. I could just sit on the back patio with this in hand and everything would be great! I love Hilton Head! I used to live in the Carolinas for a few years and know Hilton Head well! 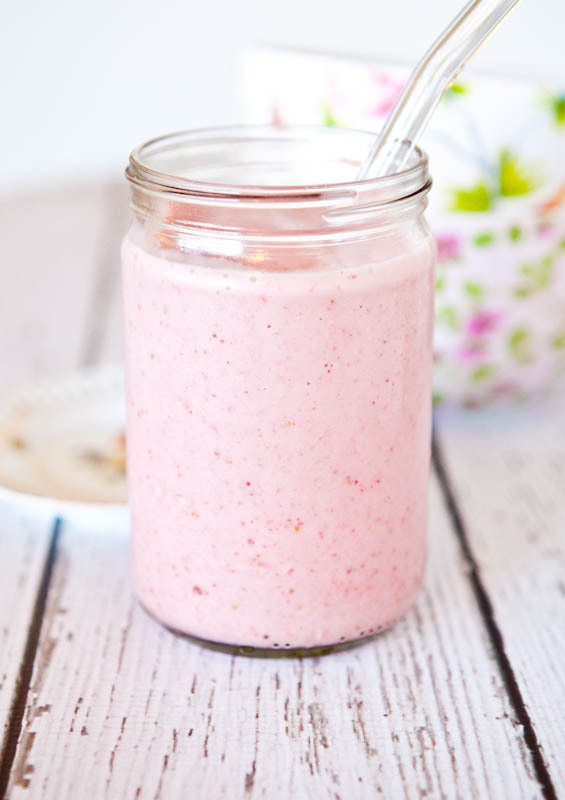 What a pretty smoothie! This is a must try! Gorgeous! I love that splash of red.